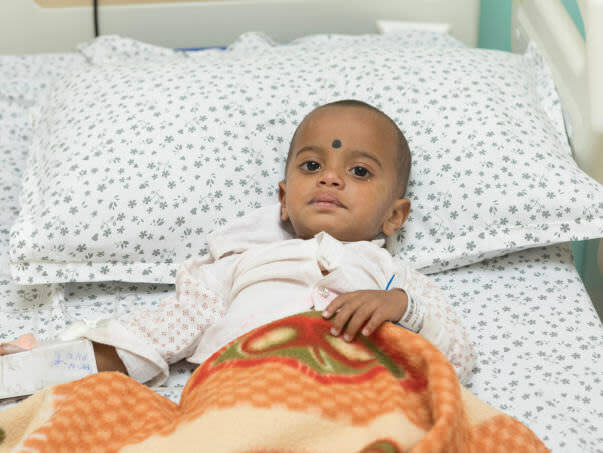 Rajesh is a 2-year-old little boy, who was very active until a few days ago. Just before last week, while he was playing outside his house, he found lumps of oxalic acid crystals lying on the floor, and before his elders could reach to stop him, he swallowed some of it. His uncle Upender saw him suddenly gasp for breath and clutch his throat in pain. And immediately rushed to his side to see what it was, and by then Rajesh had started screaming and throwing up. Upender got really scared and he took his nephew to the local hospital. 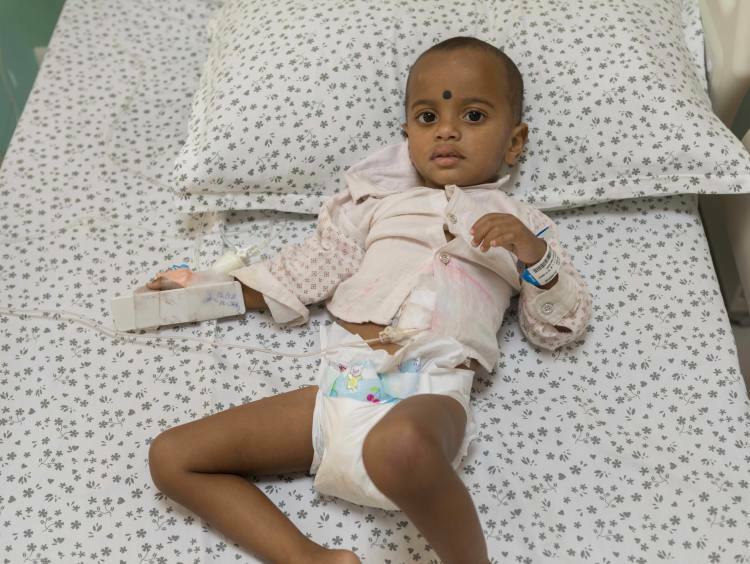 Upon hearing what had happened, the doctors referred them to Rainbow hospital in Hyderabad. Here the doctors ran various tests on Rajesh, including an endoscopy, which showed them how badly his insides were burnt due to the acid. His food pipe and stomach lining had corroded and due to that, his was unable to eat anything. Whatever he would be fed, he would throw it up right away and keep crying out in pain. Following the tests, they did a small surgical procedure where they inserted tubes into his stomach, to feed him directly, in order to make sure he gets nutrition. Rajesh was a very active kid who would run around and play all the time. But this accident has weakened him and causes him more pain than he can tolerate. In the hospital, he doesn’t talk, doesn’t get up and play, all he does is to cry softly all the time because of the pain. His parents have lost their sleep over their child’s condition. Rajesh had an elder brother Harish, who was born with developmental disorders. He was physically handicapped and bedridden since birth and had stunted physical growth. 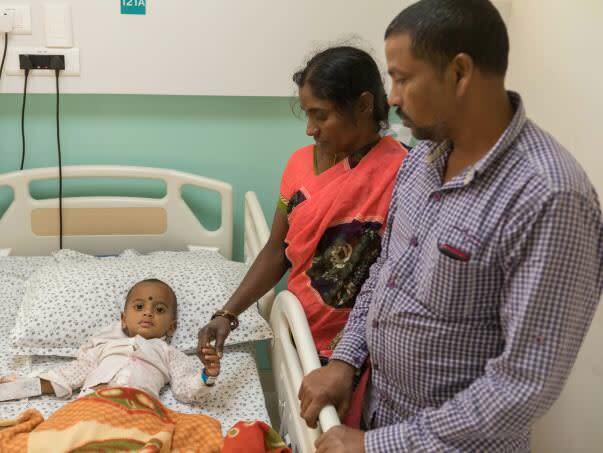 5 months ago, his disorder took his life and the parents, Venkanna and Bubamma are still recovering from the shock of his sudden death. They were grateful that at least their second child is healthy and now they’re shattered at his condition. They just can’t afford to lose their second child too. 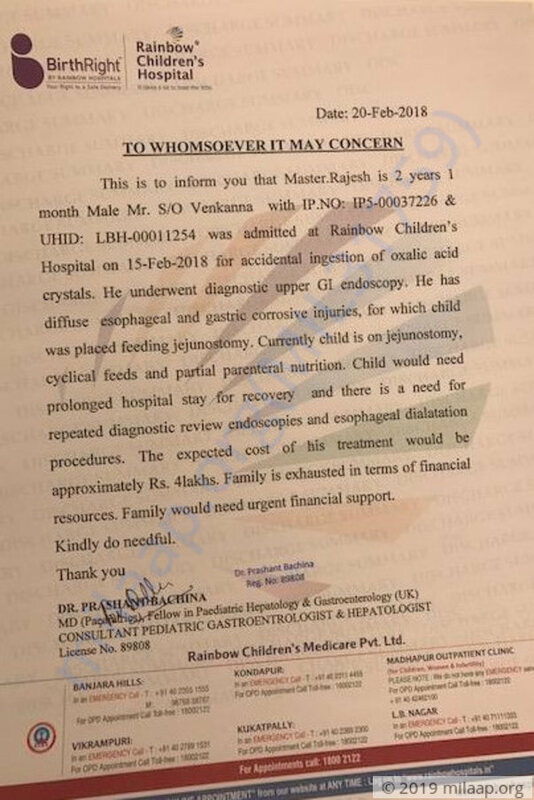 Venkanna is trying his best to save his son from suffering, but he can’t do much without money and his financial status will not allow him to pay for Rajesh’s treatment. 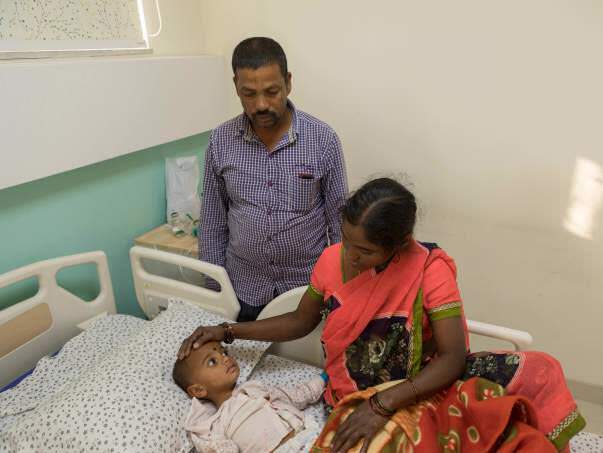 So far, they have spent over Rs 80,000 over his treatment by mortgaging gold and borrowing money from relatives and friends, but now they have run out of all the money and can’t afford the prolonged treatment Rajesh needs, in order to recover. 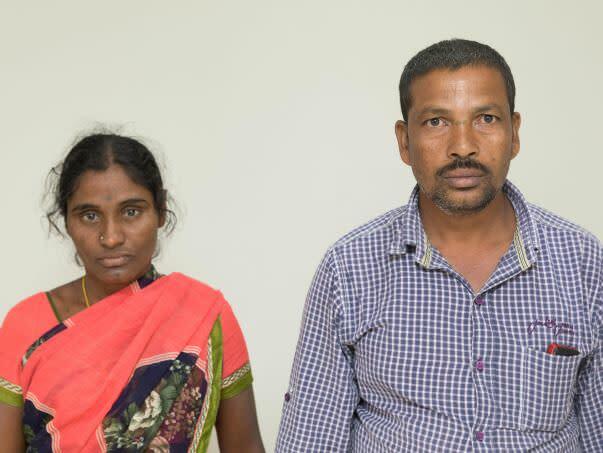 Venkanna works and daily wage labourer and his wife works as a domestic help in their village in Khammam district. Between the both of them, they earn only just enough to make ends meet. Upender helps them out in whichever way he can, with running the household finances, but all their money put together is not enough for Rajesh’s treatment. In order to save their little boy’s life, they need your help. Your contribution can bring Rajesh out of his pain and misery. Thank you for the wonderful support that you have shown towards my nephew Rajesh. He is doing better now compared to earlier and based on his health and recovery the doctors have discharged him on Sunday (25th March). He has been advised regular follow-ups to monitor his health. Thank you all once again for the support. Your support and blessings have helped him to recover faster. Please do pray for his speedy recovery. Thank you for the wonderful support that you have shown towards Rajesh. He is doing better now compared to earlier. He has successfully completed two procedures and has no infections. The doctors suggest that he is recovering faster than expected. If he recovers at this pace then he will be discharged soon. Thank you all once again for the support. Your support and blessings have helped him to recover faster. Hope this little boy gets all the support he can whether it be financial or emotional. God bless him and may his recovery be soon.